This transitional linen tower belongs to the exquisite Tiffany design series. It features a rectangle shape. This linen tower is designed to be installed as an floor mount linen tower. It is constructed with cherry wood-veneer. This linen tower comes with a lacquer-stain finish in Coffee color. Features 3 medium sized pull-out drawers with soft-close drawer slides with dove-tail joints. Undermount hidden drawer glides. Solid wood frame with a multi layer 7-step stain finish. Assembly required. Accessories not included. The Kelly Collection 22 in. X 65 in. Linen Tower commands attention in any bathroom. Three open shelves and three soft-close drawers provide plenty of storage. The elegant detailing and Grayish Blue finish catch the eye and match perfectly with any Kelly vanity or as a standalone furniture piece. 24 In. W X 82 In. 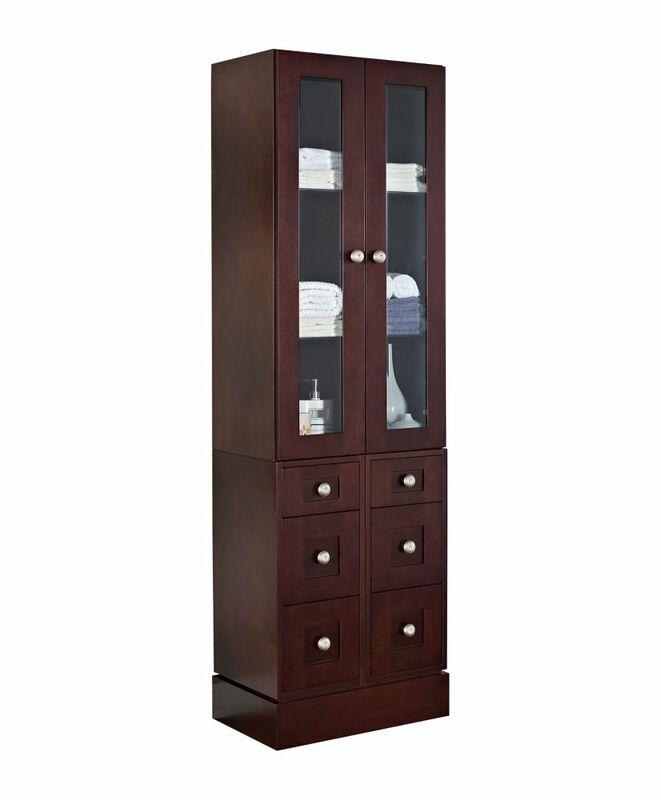 H Transitional Cherry Wood-Veneer Linen Tower In Coffee - Brushed Nickel This transitional linen tower belongs to the exquisite Tiffany design series. It features a rectangle shape. This linen tower is designed to be installed as an floor mount linen tower. It is constructed with cherry wood-veneer. This linen tower comes with a lacquer-stain finish in Coffee color.